Here’s the first post. I’ve got a second one to send in a bit. I’ve got to check my daughter’s history lesson, and then I’ll photograph the second pack and send it over. Are you working on letter identification with your preschoolers this fall? This fun alphabet game is perfect! Kids can work on uppercase and lowercase letter identification with a fun fall theme. Just print, cut, and go! It’s as easy as that! Whether you’re working on uppercase or lowercase letters with your preschoolers, this alphabet game is perfect for your fall homeschool preschool lessons. 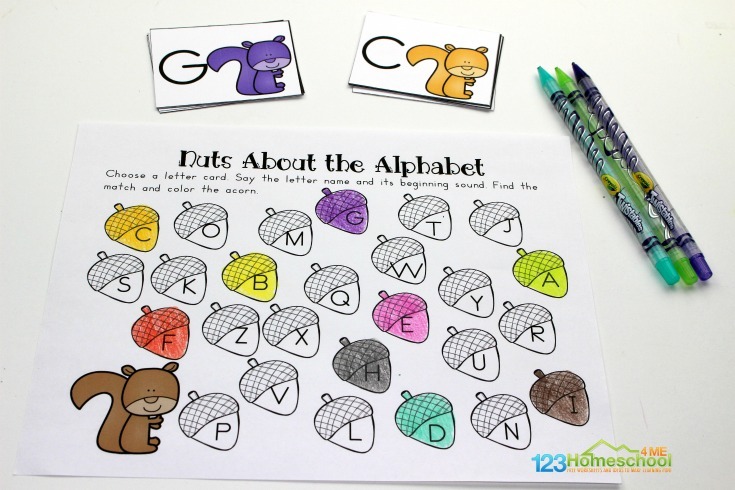 Print out the squirrel alphabet cards. There is one set of uppercase cards and one set of lowercase cards. Cut each set apart. Laminate them for durability. You can mix them together, or you can store them separately depending on what your focus is at the moment. To work on letter recognition, you can use these cards like flashcards. Hold up a card and have your preschooler name the letter featured on the card. Or, spread them out and have your preschooler hunt for the card you name. To work on letter matching, you can do one of two things. You can print two of each set of cards – meaning you’ll have two sets of uppercase cards and two sets of lowercase cards. This allows you to have your preschooler match uppercase to uppercase and lowercase to lowercase. Or, you can just print out one set of each and have your preschoolers match uppercase to lowercase. 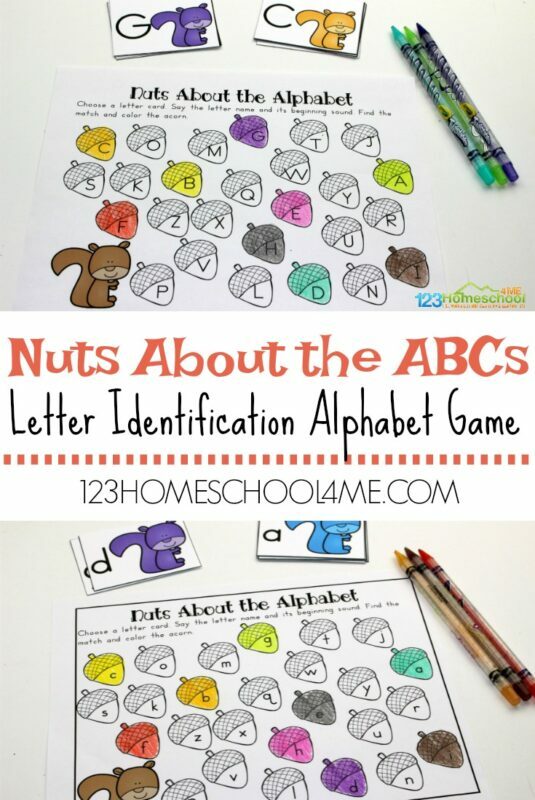 You can take the letter matching activity one step forward by using the Nuts About the Alphabet recording page. 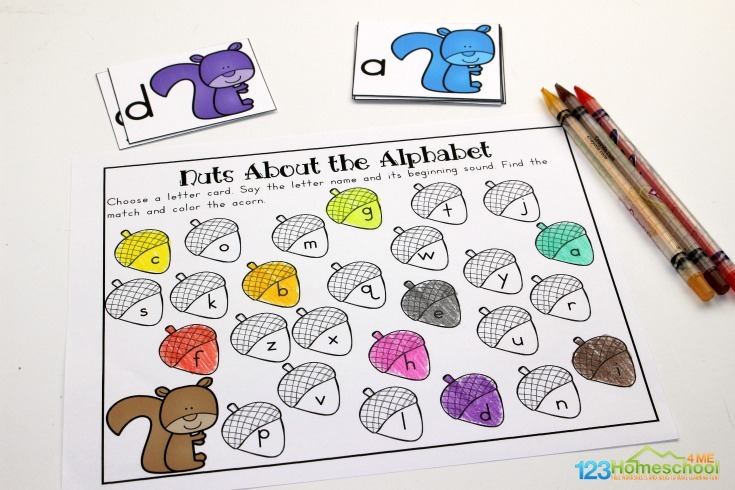 Have your preschool choose a squirrel letter card, and find the matching acorn on the recording page. Color the acorn to match the squirrel. These activity sheets can be used multiple ways. Your preschooler can match uppercase to uppercase, lowercase to lowercase, or lowercase to uppercase. This activity is easy to use with preschoolers at multiple stages of letter identification and letter matching, because it includes both uppercase and lowercase letters.